For our eleventh (yes, eleven already!) monthly progress post, we prepared some more in-game sneak peeks, as well as long-awaited reveals, so let’s just jump straight into it! Keeping on the trend started last month, we’re going to present charts expressing development progress for each respective month. In November, our programmers got more involved in furthering the important systems needed to complete the ‘creation’ phase of the game. Not only did we begin polishing our building system and create the necessary interface layouts for it, but we also started cracking down on more complex construction features, such as fences and paths, which we are going to show more for in the months to come. Our intent for this late part of the year and the early part of next year is to keep developing and polishing our creation mechanics in sight of the first pre-alpha build completion. 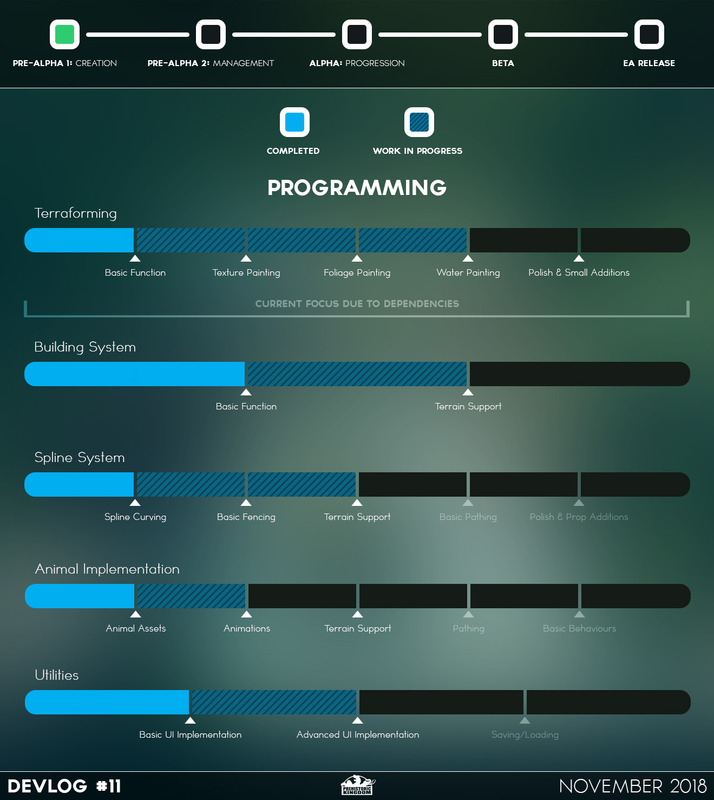 Like we mentioned earlier, all our programmers got more involved in the game-making process, resulting in an increased progress pace all across the board. While we still have a long way to go before our creation systems are completely finished, here’s a sneak peek at our early building system. In the near future, we would like to add more visual indication of building placement; you can count on particle effects and even construction site effects. Moreover, the building models themselves will get more love: plants, custom path foundation and even their own animations (e.g. 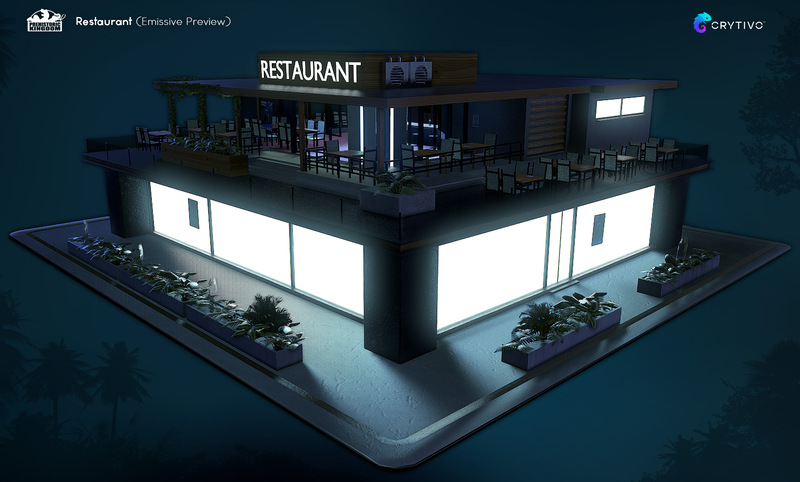 a full restaurant would be buzzing with guests). Please keep in mind these clips were recorded on a test level and are NOT representative of final graphics. Obviously, the building system wouldn’t be much without proper demolition and selection, so here’s a reminder of the mechanic vision we’re going for when it comes to these two features. In the next couple of months, our 3 programmers are going to be busy with bringing these concepts to life, dividing their workload into 3 main tasks: fence/path making (Matt), building, selection, demolition and assorted visuals (Mau) and finally level design and shader work (Victor). Our gameplay programmer has finally gone ahead and turn all those lovely GUI concepts into actual, functional game interface. It might not look like much progress from the demo, but the quality increase is definitely there, compare and contrast. 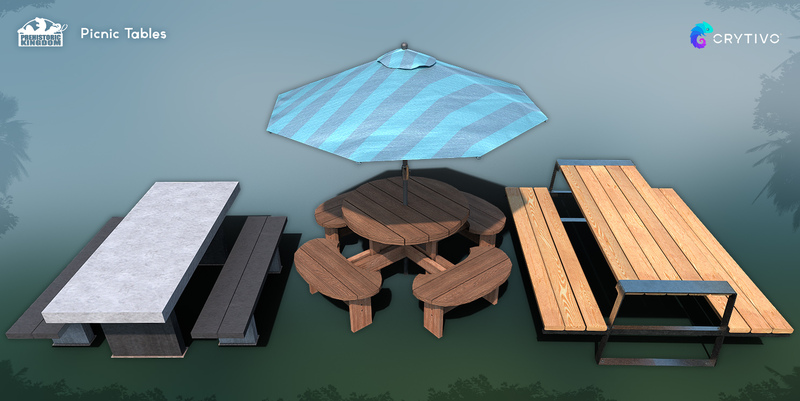 As always, our art staff has been super busy with asset creation. It’s actually kinda scary how quickly they are cycling through their assignments: soon enough, we’re gonna run out of cool things to show. 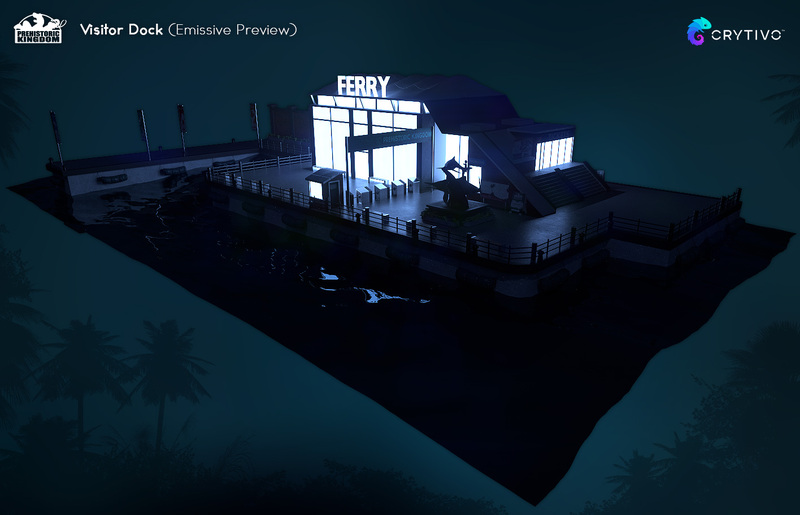 This month would oversee the completion of 67% of the buildings bound to appear in the Early Access release. As such, we are excited to show more of the park’s future scenery, as well as some fences and other important structures. 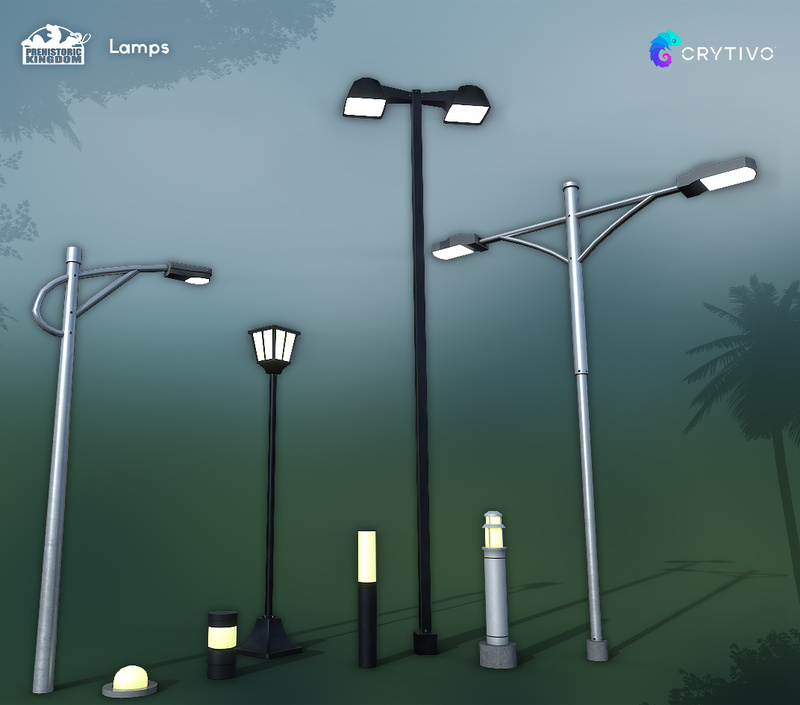 A variety of lamps and light posts can be used to decorate your pathways during storms and night time. A classic staple of any zoo, players can use tables to create their own parks and sitting areas. Sturdy and tall, the electrified metal fence is great for containing some of your most precarious creations. The wooden cable fence is used to contain small animals and is recommended for exhibits with moats or trenches. Whilst functional, some unhappy creatures may find it easy to escape if not cared for correctly. 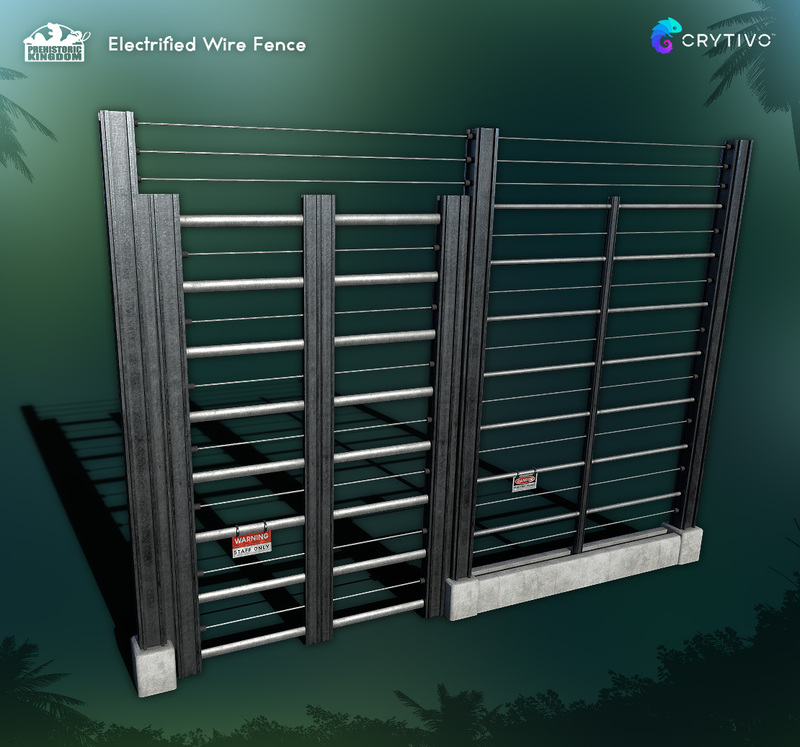 Akin to designs found on farms, this fence provides high visibility at the cost of lower security. Security cameras are used to monitor and notify Park Rangers of escaped animals. Players should be conscious of their directional properties as the small security camera can only see one perspective. 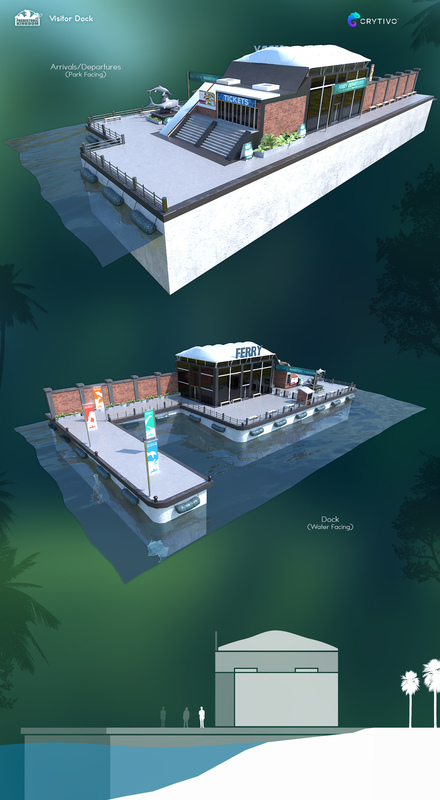 The Visitor Dock allows guests to enter the park via ferry transport across the ocean. One way in and one way out – what could possibly go wrong? Thriving with entertainment and hungry patrons, the restaurant serves as a place to eat for guests of all ages. Squint and you might just catch some easter eggs inside the top floor! 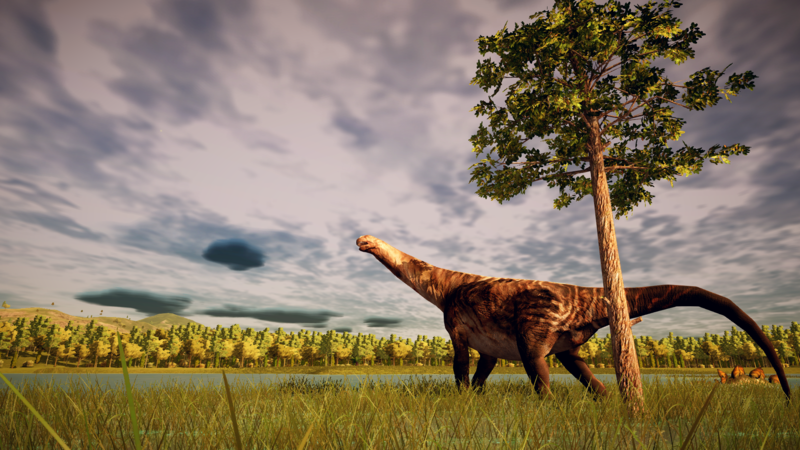 We are excited to reveal the first in a series of animation showcases, the Edmontosaurus using the Hadrosaur rig! We have been hard at work creating the base animations that are gonna help outline the animal’s future behaviour in the game, making sure the movements match not only the animal’s look, but also its size and presence. Keep in mind most of these animations will be used again for the other hadrosaurs in Prehistoric Kingdom, albeit with slight variations and adjustments. Enjoy! This month was unusual for our musical composition, as we experimented more with the game’s music pieces that add to the soundscape, but aren’t ultimately part of the main soundtrack, persay. 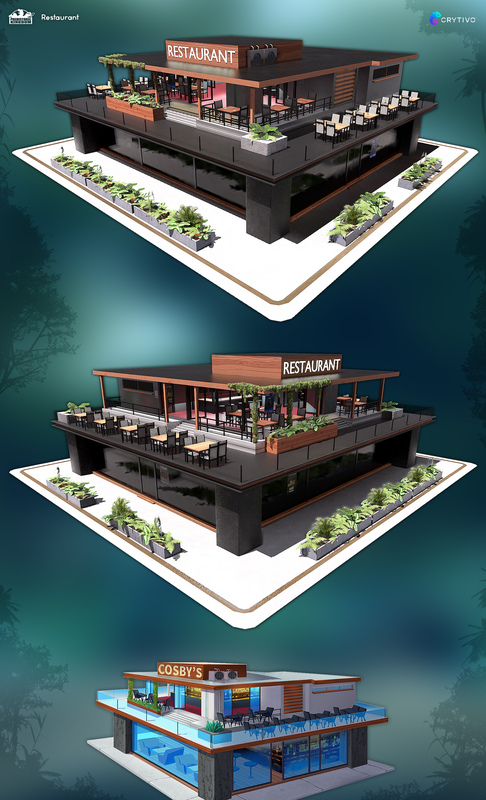 The restaurant needed some love, so Byron thought of composing two jazzy tracks to complement the structure’s atmosphere. They are the kind of music you would expect in restaurant, lobbies, and assorted fancy places (such as elevators, they are undeniably fancy). We had a lot of fun with this experiment especially, since it allowed us to play with variations of our main theme that would otherwise not see the light of day. On the sound design front, we have been making progress with general SFX, preparing sound files for every part of the first alpha build. When it comes to environment, we have been breaking audio queues to fit the different climates we have, as opposed to the broader sea-plain-forest system we were using. Following comes a taste of the tropical wet sound design. Keep in mind we would like our in-game system to feature different sound zones depending on the current climate implemented. Last month saw the last of our Early Access receive their default skins. 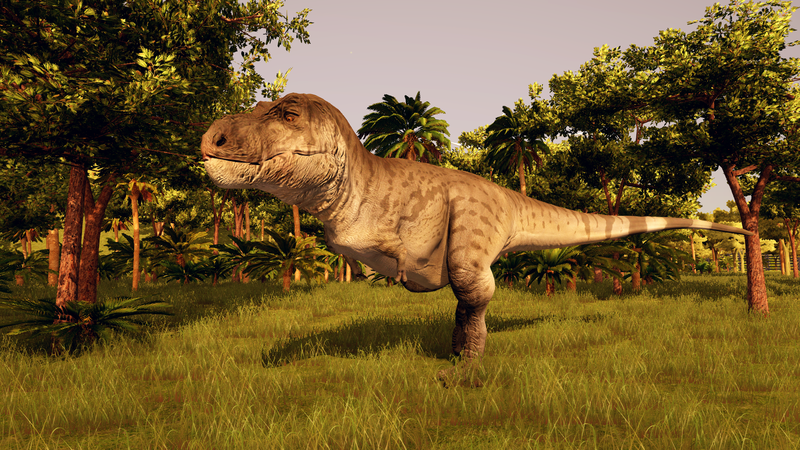 Seeing as how that means we have no more modelled animals to reveal, we will be focusing instead on each species’ alt skins, infant skins, and genetic variations. We have shown the new Trike designs last month, and since, our animal texture artist has been hard at work bringing those renditions to life through the revamped Triceratops! Enjoy all the 4 skins, 2 for each species! With that in mind, we decided to give our other ceratopsians some well-deserved love. 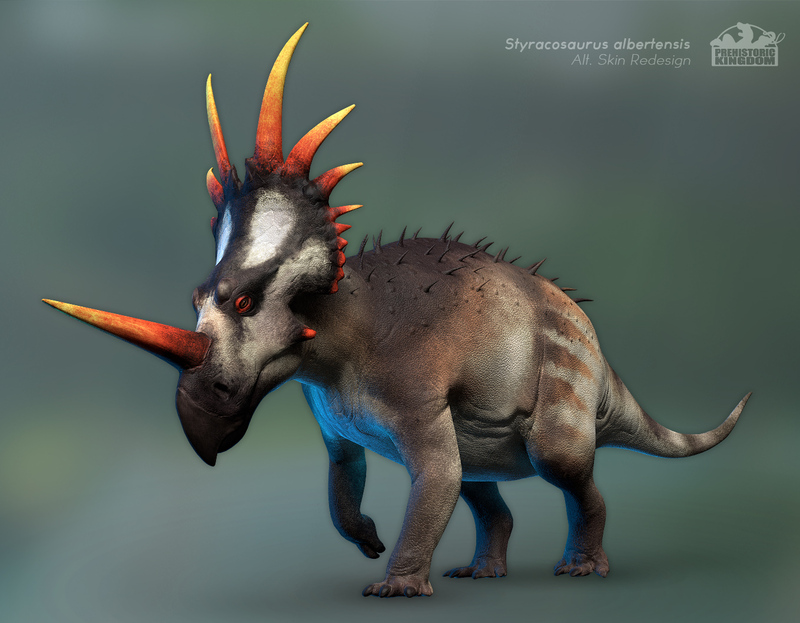 Welcome the remaining alt skins for Protoceratops and Psittacosaurus, as well as a reworked 3rd alt skin for Styracosaurus! All this new content gave us a great opportunity to take a family picture, for no less than the ceratopsian family and relatives! 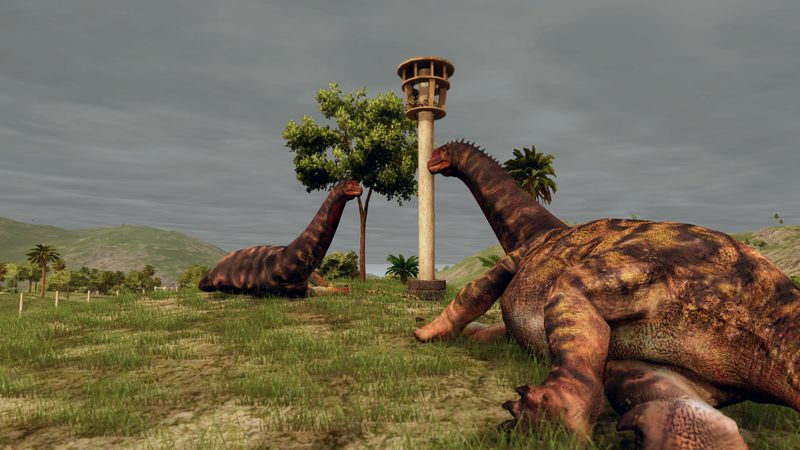 Enjoy Prehistoric Kingdom’s Marginocephalia! It’s time! Like we announced in our previous blog post, we would be revealing the design for the first confirmed animal to make it into Prehistoric Kingdom after the initial 50 animals, Spinosaurus aegyptiacus! While we won’t actually start production for this animal until soon after the initial release, we are excited to present our take on this large carnivore’s design, hoping that you’ll be as fond of it as we are, and hoping that it may put some curiosities to rest. Check its Artstation presentation for a better look at the lit and flat colored versions of the concept. The peculiarly short-legged Spinosaurus will make for a fine addition to any park it is put in. This month we hosted a Q&A event where we received a staggering 375 submissions! We talked about animal designs, some behaviour elements and even gameplay mechanics. We loved answering your questions, as it allowed us to dispel some confusion as well as hold a nice communication platform. Needless to say, we definitely enjoyed the experience as a whole. Let us know if you’d like for events like this to happen again in the future! We just got around revealing our Spinosaurus and we already have fanart for it! How cool is that? Taken by X Stream Chaos. Thank you for reading November’s development update! We’re gonna continue working towards meeting all the internally set goals for our first pre-alpha over the coming months, effectively making this our #1 priority. The creation part of the game is the most challenging by a large margin, but each month we get closer and closer to the expected results. Stay tuned!